how small-cap stocks are underestimated. 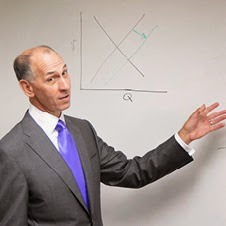 A new paper by Simon adjunct lecturer Frank Torchio ’82S (MBA) and colleague Sunita Surana provides new insight into the proper way to perform a discounted cash flow valuation for fair-value assessments. Torchio is an expert in forensic economics. In “Effect of Liquidity on Size Premium and Its Implications for Financial Valuations,” he and Surana argue that small-cap stocks are often undervalued in merger litigation. For example, Company A buys Company B, paying a premium. If shareholders of Company B are not happy with the price being offered, they may invoke their appraisal rights and sue. The lawsuit requires both plaintiff and defendant to present valuations of Company B, which are generally based on discounted cash flow (DCF) analyses. It has become customary for valuation practitioners to add to the weighted average cost of capital (WACC) for such DCF analyses, a premium if the company being valued has a small capitalization. The most common cited source of historic size premium has been from Ibbotson Associates. Torchio and Surano’s paper shows that the historic size premium used by many valuation practitioners is really measuring the historic premium required for holding less liquid stocks. This is because small-capitalization stocks have disproportionately lower liquidity because they are more likely to be thinly traded. Thus, if the WACC includes a liquidity premium, then the ultimate DCF valuation will reflect a discount for a lack of liquidity. But law governing merger litigation requires a computation of “fair value,” and the law states that fair value cannot include any discount for lack of liquidity, Torchio says. “So for those merger valuations that include a historic size premium for small-cap stocks, the value of small stocks is underestimated because that premium is in large part a premium for the lack of liquidity for such small-cap stocks. They underestimate the value of those small stocks by adding the published historic size premium to the weighted average cost of capital,” he says. Whether the value obtained from a DCF analysis that uses the standard-size premium is the fair value of the stock is left to the courts and legal scholars to decide, Torchio says. But by quantifying the effect of the undervaluation, the paper provides a fresh economic context to help answer the question. I have observed the company formation agents deeply while they carry out the entire procedures as a part of their professional responsibilities. Therefore, I don’t have to worry about completing the legalities pertaining to the registration of my new company. Are Successful Entrepreneurs Just Lucky?